Oxide dispersion strengthened (ODS) alloys make use of incoherent and highly stable dispersoids to achieve superior creep, coarsening-, oxidation-, and corrosion-resistance compared to conventional alloys. However, while ODS alloys are well-suited for operations at high temperatures (such as power generation and engines), they are difficult to process while maintaining the nanosized oxide dispersoids throughout the metallic matrix. Recently, powder-bed additive manufacturing (AM), consolidated using selective laser melting (SLM), has been demonstrated to melt and solidify an ODS Ti-based alloy into complex geometries without agglomeration or melting of the oxide dispersoids, or overall part shrinkage. Here, we investigate aluminum ODS alloys: first alumina dispersoids in a pure aluminum matrix, and then alumina and yttria dispersoids in an Al-Sc matrix capable of Al3Sc precipitation in solid state. We focus our research on phase transformations (melting, solidification, dissolution, precipitation, and coarsening) in these heterogeneous materials systems. Whether the oxide particles remain uniformly dispersed throughout the liquid, are pushed into grain boundaries by growing grains, or dissolve and reprecipitate in the liquid pool greatly affects the size, orientation, and spatial distribution of both grains and dispersoids in the solidified structure and affect mechanical properties of the solidified product. So does Al3Sc precipitation in the solid state after solidification upon cooling and subsequent aging treatment. By varying the laser intensity, laser speed, particle size, layer size, and oxide volume fraction, we can tailor the microstructure to optimize strength, ductility, toughness, and creep resistance. This work is performed in collaboration with Drs. Jon Almer, Aaron Greco, and Tao Sun at Argonne National Laboratory, using tomography and imaging capabilities at the Advanced Photon Source. Techniques performed at Northwestern University include sample preparation, metallography, SEM, and TEM. Figure 1. 170 μm layer of 2%vol Al2O3 80-nm powder on pure Al plate. 500W laser, directed onto the top of the powder layer from above, moves from left to right at 0.5 m/sec. The melt pool extends ~120 μm into the solid Al. 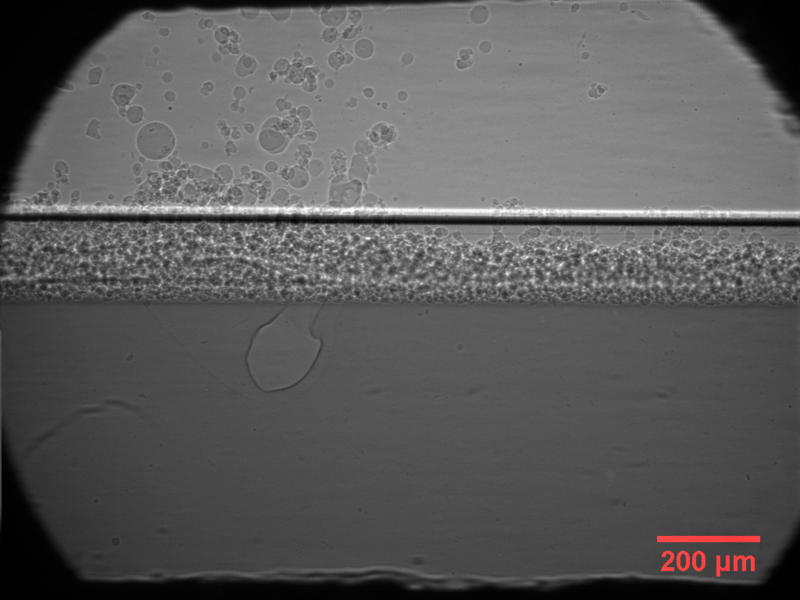 Some powder on the surface is kicked up along the laser's path. C. Kenel, K. Dawson, J. Barras, C. Hauser, G. Dasargyri, T. Bauer, A. Colella, A.B. Spierings, G.J. Tatlock, C. Leinenbach, K. Wegener, Microstructure and oxide particle stability in a novel ODS γ-TiAl alloy processed by spark plasma sintering and laser additive manufacturing, Intermetallics. 90 (2017) 63–73. doi:10.1016/j.intermet.2017.07.004. C. Kenel, G. Dasargyri, T. Bauer, A. Colella, A.B. Spierings, C. Leinenbach, K. Wegener, Selective laser melting of an oxide dispersion strengthened (ODS) γ-TiAl alloy towards production of complex structures, Mater. Des. (2017). doi:10.1016/j.matdes.2017.08.034. C. Kenel, A. Lis, K. Dawson, M. Stiefel, C. Pecnik, J. Barras, A. Colella, C. Hauser, G.J. Tatlock, C. Leinenbach, K. Wegener, Mechanical performance and oxidation resistance of an ODS γ-TiAl alloy processed by spark plasma sintering and laser additive manufacturing, Intermetallics. 91 (2017) 169–180. doi:10.1016/j.intermet.2017.09.004.